An International Women’s Day market will take over Fairfax’s Caboose Brewing Company a day early on Thursday from 4 to 6 PM. Over 15 women-owned small businesses will run pop-up shops out of the space in Vienna. Shoppers can sip brews while they browse wares from Skips and Flutters, Park Story, and more. Restaurants are also commemorating International Women’s Day this Friday with charity. Georgian restaurant Supra will pour wine from female winemakers (discounted at $10 off select bottles) and host a fundraiser for N Street Village with 8% of sales going towards the nonprofit. Meanwhile Doron Petersan’s vegan diner Fare Well makes a Shirley MacLaine cocktail with Civic vodka and cherry flavors from Ivy City’s woman-owned distillery. A portion of proceeds will support Planned Parenthood. 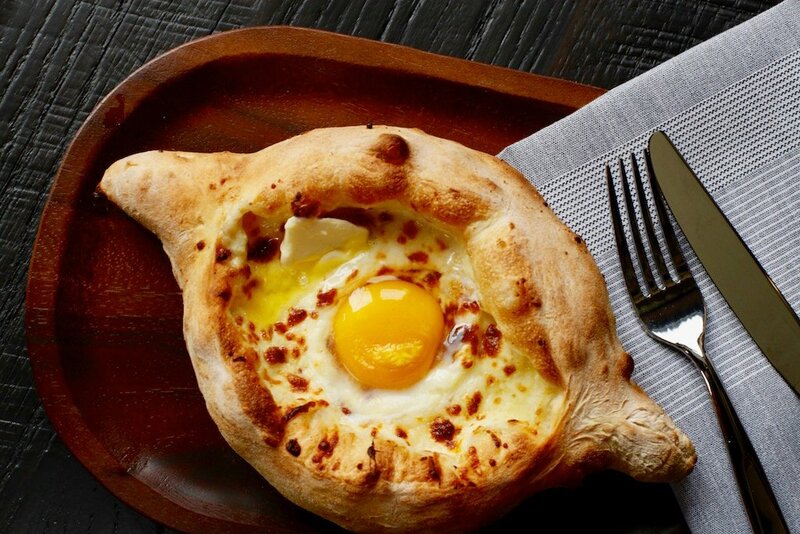 Khachapuri with egg yolk at Supra. Photo by Evy Mages. Fast-casual Israeli eatery Little Sesame hosts a musical party, Beatbox Vol. 1, on Friday evening. The $15 ticket grants entry to Eckington’s The Sunroom, where local artist Elikeh and Brooklyn-based DJ Center will perform Afro-pop and global music. Guests can grab Little Sesame pita sandwiches and seasonal salatim from a retro food truck and purchase beer, wine, and cocktails. Charles Ponzi’s 137th birthday, it turns out, was Monday. Atlas Brew Works plans to celebrate the infamous swindler with kegs upon kegs of its new Ponzi IPA. Head to bars like Roofers Union, The Blaguard, Pizzeria Paradiso, and Penn Social during regular business hours. At each location Atlas fans can meet members of the team and grab some brewery swag. 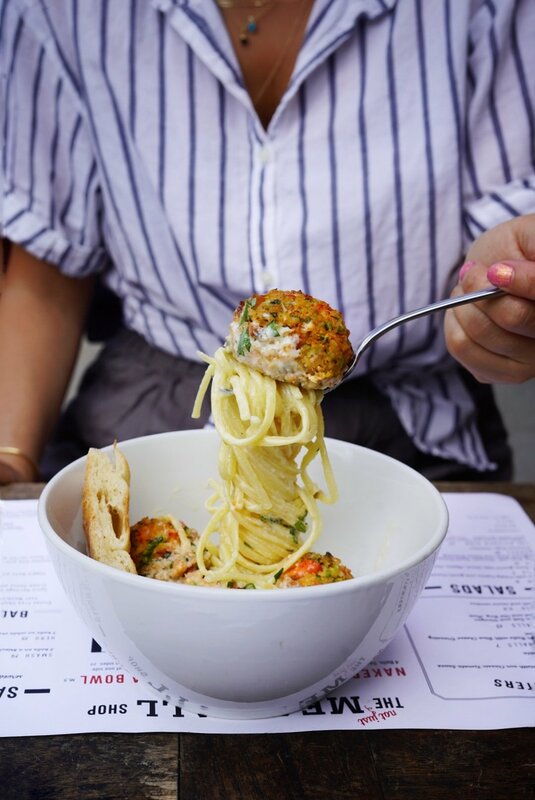 The Meatball Shop is hosting an eating competition on Saturday to see who can finish a massive “bucket-of-balls” in under 10 minutes (about 25 meatballs to be eaten individually or in a team of two). Successful diners will receive a $55 gift card to the restaurant and entry into a raffle. Not a competitive eater? The restaurant will also begin selling its seven-pound meatball-spaghetti combo for $100 on March 9 (yum?). Just be sure to call 24 hours in advance and fast 48 hours to prepare. Photograph courtesy of the Meatball Shop. For the fifth year in a row DC Brewers’ Guild will host Hop Fest, a fundraiser for local brewers. Stop by DC Brau on Saturday from 1 to 5 PM to try rare, popular, and limited-time offerings from more than 30 area breweries including Denizens, 3 Stars, and Mad Fox. Tickets are $30 to $40. Can’t wait until St. Patrick’s Day? Sunday is Ireland on the Wharf, an Irish festival at the waterfront featuring bagpipes, live music, dancers, and a beer garden. Kirwan’s Irish Pub and Guinness welcome revelers of all ages to party along the Wharf’s District Pier from 1 to 6 PM. Dreaming Out Loud, a local nutrition-focused nonprofit, hosts monthly family cooking classes with the help of DC Central Kitchen and the farm at Kelly Miller Middle School in Northeast DC. This month’s class, Monday from 5:30 to 8 PM, will focus on breakfast-for-dinner. Parents can learn to make sweet potato pancakes, omelets, and fruit salad. Pi Day (March 14) falls on Thursday this year, and Whisked! wants to make sure Washingtonians are ready. Pie maker Jenna Huntsberger will teach a class on perfecting pie crusts on Wednesday from 6:30 to 8:30 PM at Mess Hall. Guests will sip wine and create take-home pies with (hopefully) buttery, flaky crusts. Pro tip: Don’t forget to grab tickets to New Kitchens on the Block on April 7 (passes often sell out). Attendees at the annual party get a chance to try fare from yet-to-open restaurants. This year 11 chefs will introduce new concepts, including Kevin Tien of Himitsu who’ll preview Emilie’s, and Bresca‘s Ryan Ratino who’s showcasing Jont.